When we work together, we win! We are pleased to inform you that on Tuesday, January 15, 2019, the Eastside LEADS (Leadership for Equitable and Accountable Development Strategies) coalition won important community benefit concessions from the University of Southern California (USC) and its contracted developer - American Campus Communities (ACC), in relation to a 95-unit graduate student housing project to be built on the University’s Health Science Campus (HSC) in Boyle Heights. This community win is a result of our coalition’s 6-month campaign to challenge UCS’s and ACC’s development that began on June 26, 2018. As one of the largest institutions on the Eastside, it is concerning that USC has been moving forward with a 30-year master plan for its Health Science Campus without community stewardship and inclusion – a concern that our coalition came together to change. At the heart of Eastside LEADS is the belief that current residents must guide and benefit from new development, instead of being excluded from the planning process. For many years, residents in the Eastside have felt the negative impact of the USC Health Science Campus development projects. Nearby Ramona Gardens/Hazard Park residents are feeling the most pressure as they see their neighbors priced out of their long-time homes by landlords who demand higher rents and prefer to rent to students. Meanwhile, residents have had little say in how development at the Health Science Campus occurs. Together with area residents, we shared these concerns with the City of Los Angeles Planning Commission and the Office of Councilmember Jose Huizar (Council District 14). Thanks to the strong determination of residents to make their voices heard and the support by partner community organizations, there is now a commitment by USC to hold ongoing discussions with community stakeholders about its future construction. USC’s development partner ACC has also committed to provide specific community benefits as part of its graduate student housing project, including a job training fund of up to $100,000, the hiring residents that live near the project for at least 25% of the total construction jobs and reserving at least 10% of the jobs for residents with barriers to employment (i.e. disadvantaged workers). You can read more details about the community benefits USC/ACC pledged in the documents posted on our website. These type of community benefits are an important first step in the right direction. 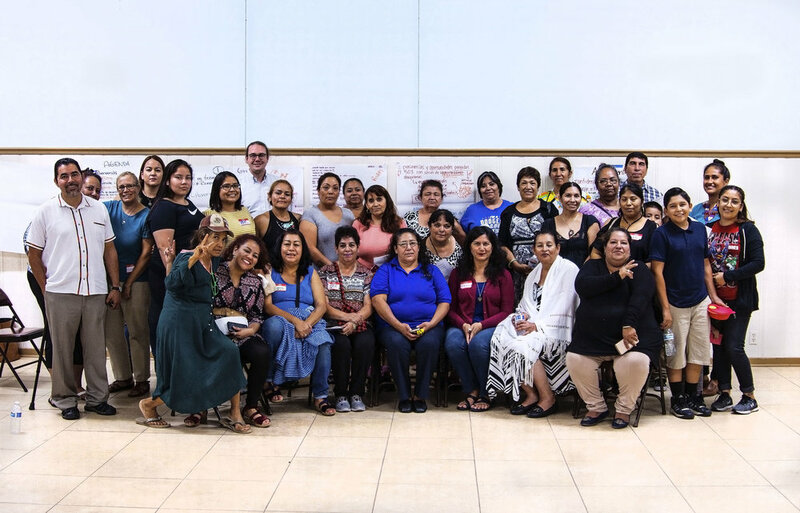 Moving forward in 2019, Eastside LEADS will continue to work with resident leaders, partner organizations, allies and the greater Eastside community to ensure that the commitments made by USC are honored. We plan to work with our elected officials to develop policies that will change how development in our communities occurs: to ensure that low-income families are not displaced and that new economic opportunities are shared by all residents. Our resistance against unaccountable development and rampant displacement is strong when we work together, support our intersectional movements and share our strengths. Join us to hold developers accountable and to fight back against displacement in the Eastside! Eastside LEADS youth and parent leaders at LA City Hall on January 15, 2019. Eastside LEADS (Leadership for Equitable and Accountable Development Strategies) is a coalition of Boyle Heights Building Healthy Communities, a 10-year initiative funded by The California Endowment that is led by a collaborative of over 26 community nonprofits and works alongside residents in advocating for equity investments in health, education and neighborhoods. To learn more about our initiative, please visit EastsideLEADS.org.